Whether it’s for a weeknight supper, special occasion or large family gathering, this recipe for Roasted Italian Sausage & Potato Bake will make everyone happy. I grew up in a large extended family and many of my childhood holiday celebrations consisted of a bare minimum of 19-20 people. To me, it was fun to get to hang out with all of my cousins, aunt, uncles and grandparents all in one location. 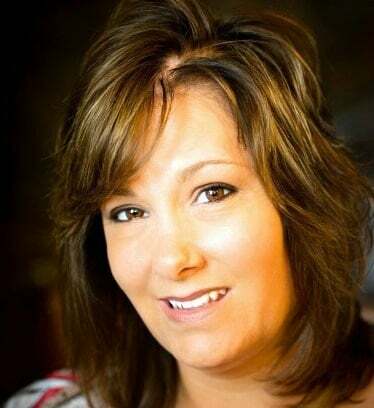 But I never really thought about how much work that could be for the person hosting. Sure, everyone brought something to help complete the meal and also helped in the kitchen, but a lot of work goes on behind the scenes like planning the menu, shopping, preparing the meal and getting the house in order. Things and tasks that some people might not think about. That is until I got older and hosted parties for well over 100 people myself and realized what a project it was. 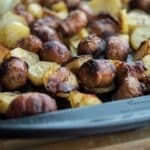 So with holidays and graduations on the horizon, I wanted to create a recipe that was not only good for the family dinner table, but was fit for a crowd, and came up with this recipe for Roasted Italian Sausage & Potato Bake. 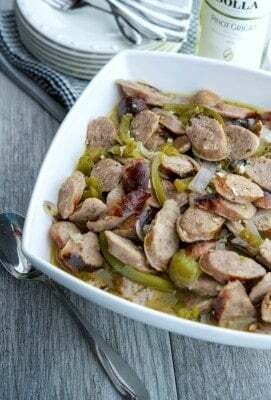 I wanted to create another Italian sausage recipe as sausage always seems to find its way in our family gatherings; mostly with sausage and peppers. But this recipe for Roasted Italian Sausage & Potato Bake takes a lot less time to prepare (only 10 minutes!). 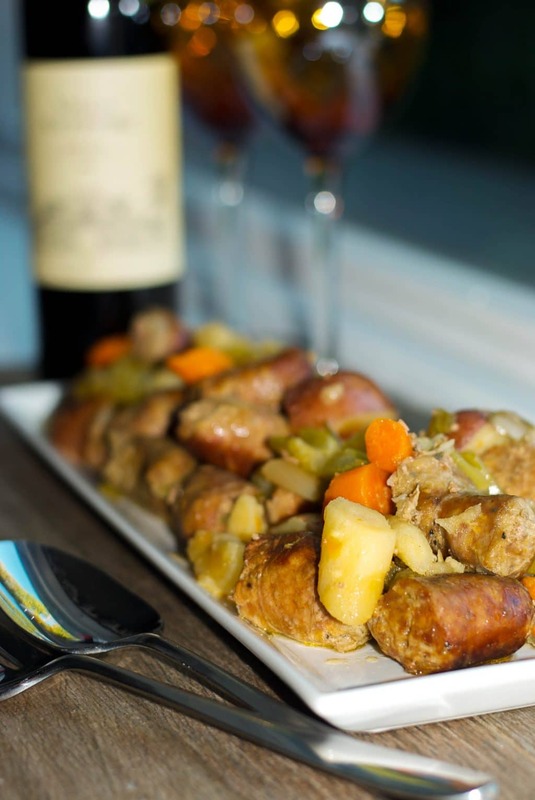 This recipe contains Italian sausage links that I cut into thirds (I used sweet, but you can substitute hot), sliced Russet potatoes, fresh garlic, rosemary, Balsamic vinegar and Extra Virgin Olive Oil. Just mix everything together in a large bowl, place on a baking sheet; then pop it into the oven and let it do all of the work. That’s it! Easy right? 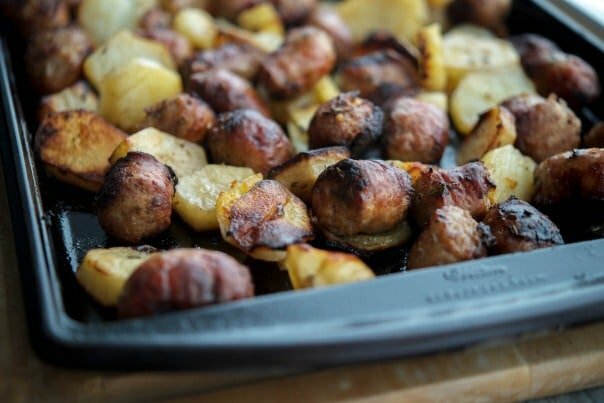 I have a very seasoned baking sheet that I use only for roasting, but if you have a newer pan I suggest lining it with aluminum foil before adding the sausage and potatoes for easier cleanup. 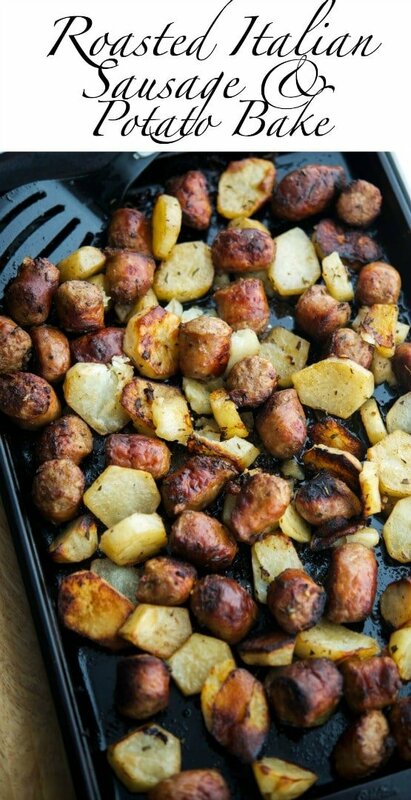 This recipe for Roasted Italian Sausage & Potato Bake makes enough to fill a half steam table tray so I’m guessing it will feed about 6-8 people on it’s own if you’re making it for a weeknight family dinner or about 12-14 people if served with other menu items on a buffet. 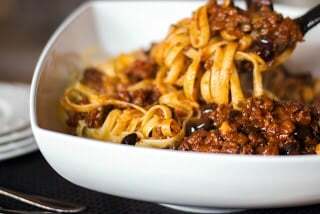 What I like about this recipe is that you can make it ahead of time and freeze it; then just reheat when you’re ready to serve and it won’t loose it’s flavor or texture at all! My family really enjoyed this recipe. In fact, I wanted to freeze some to give to our oldest daughter in college, but it never made it that far. We just kept picking on it for days! I just love recipes that don’t contain a lot of ingredients and still pack one heck of a flavorful punch. ~Enjoy! 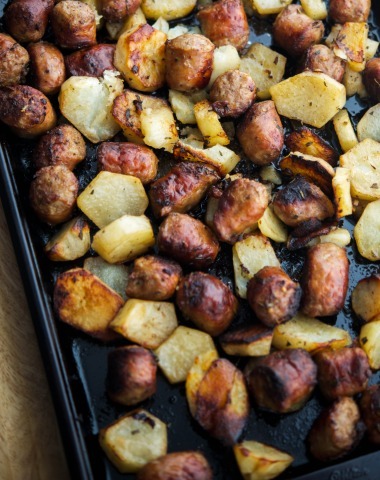 Whether it's for a weeknight supper, special occasion or large family gathering, this recipe for Roasted Italian Sausage & Potato Bake will make everyone happy. Cut the sausage links into thirds and add remaining ingredients to a large bowl. Mix well. Place mixture onto a baking sheet (line with foil for easy cleanup) and bake for 45-50 minutes turning after 30 minutes until sausage and potatoes are cooked through. *Depending on the sheet pan you use, the food may stick a bit. Try turning it more often during cooking or use parchment paper to line the pan first. 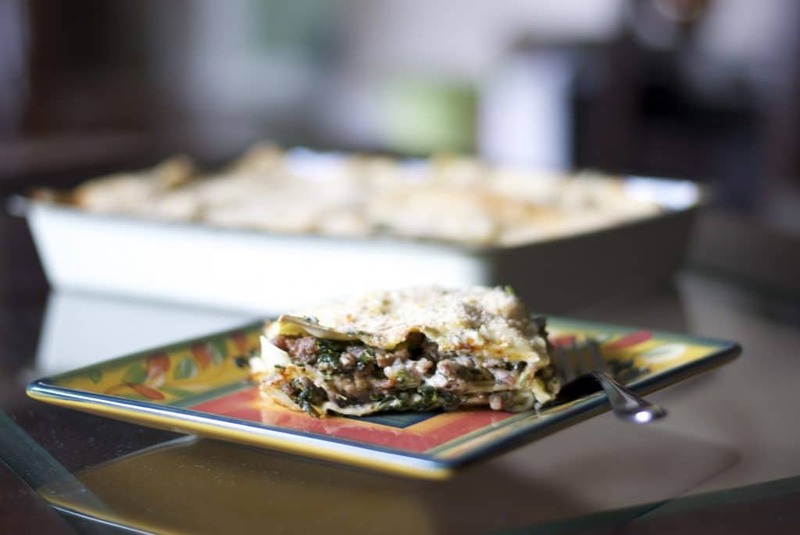 What food or recipe is a staple during your family gatherings? Im making right now only addition was I added sweet potatoes and splashed some white ine onto the sheet pan to help them soften up a bit. Smells DIVINE! Can’t wait to dig in! I’m sure the wine made it even better Julie. I hope you enjoyed it! I halved the recipe and only had ground Italian sausage so I made small patties and gave them a quick sear. 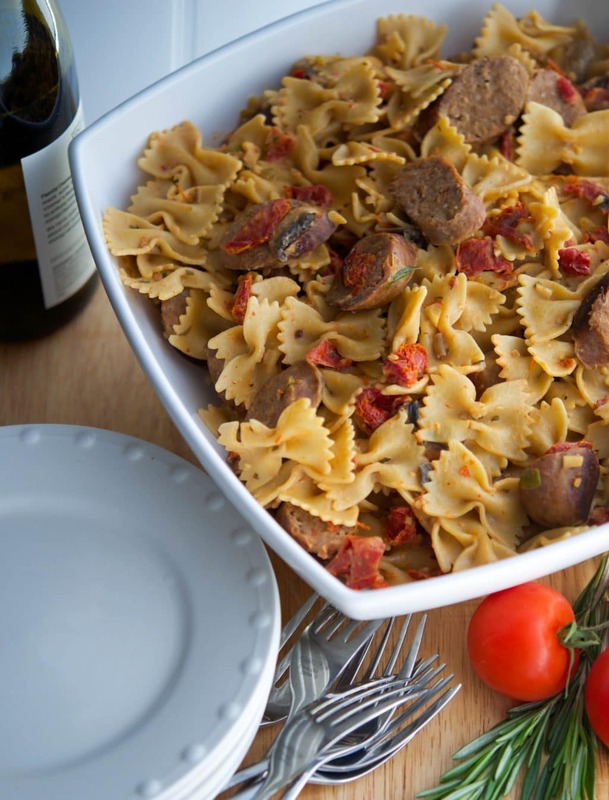 So much flavor and really easy for a weeknight! I’m so glad you enjoyed it Nakisha and great idea with the sausage. My family loves this dish. I just got online to print it out (again!). The kids asked what we were having for dinner, “I LOVE THAT!” Thanks for giving me a new family favorite. What do you think about putting Cannellini beans in it? Sure! Though you may want to wait to add them to the pan until the halfway mark so they don’t overcook and become mushy. I’ve never tried it that way, but it sounds delicious!!! I’m not sure what I did wrong, the potatoes stuck to the pan even though I used oil and used a non stick spray. Tasted delicious, just wondering if there’s any tips to help avoid the food getting stuck…. Depending on the sheet pan you use, the food will stick sometimes. My sheet pan is an old one I use just for sheet pan meals so it’s pretty seasoned. Try using parchment paper, that should help.